Daily damage from heat-styling tools, coloring and even harsh environmental aggressors can leave hair extremely damaged, feeling porous and rough. Improve hair’s condition with this nourishing cream that restores weakened, over-processed hair and ends signs of damage. >> CLICK HERE to read why this gentle recipe is so important for your daily hair damage. Work a generous amount through clean, wet hair. Gently massage into your scalp and hair, giving your ends a little extra TLC. Leave on for 3-5 minutes and rinse well. Gentle enough to use daily or as a co-wash.
Water (Aqua), Cetearyl Alcohol, Cetyl Alcohol, Stearamidopropyl Dimethylamine, Amodimethicone, Behentrimonium Chloride, Glycerin, Isododecane, Propanediol, Cocos Nucifera (Coconut) Oil, Prunus Amygdalus Dulcis (Sweet Almond) Oil, Butyrospermum Parkii (Shea) Butter, Jojoba Esters, Hydrogenated Ethylhexyl Olivate, Fragrance (Parfum), Cetyl Esters, Cetrimonium Chloride, Cystine Bis-PG-Propyl Silanetriol, Hydrolyzed Vegetable Protein PG-Propyl Silanetriol, C11-15 Pareth-7, Trideceth-12, Laureth-9, Polysilicone-15, Polyglyceryl-4 Caprate, Oryza Sativa (Rice) Bran Extract, Aloe Barbadensis Leaf Extract, Helianthus Annuus (Sunflower) Extract, Rosmarinus Officinalis (Rosemary) Leaf Extract, Prunus Amygdalus Dulcis (Sweet Almond) Fruit Extract, Moringa Oleifera Seed Extract, Prunus Amygdalus Dulcis (Sweet Almond) Protein, Laurdimonium Hydroxypropyl Hydrolyzed Keratin, Zea Mays (Corn) Starch, Panthenol, Hydrogenated Olive Oil Unsaponifiables, Polysorbate 60, Pentaerythrityl Tetra-Di-T-Butyl Hydroxyhydrocinnamate, Guar Hydroxypropyltrimonium Chloride, Xanthan Gum, Tocopherol, Disodium EDTA, Citric Acid, BHT, Caprylyl Glycol, Phenoxyethanol, Benzyl Alcohol, Chlorphenesin, Benzoic Acid, Sorbic Acid, Benzyl Salicylate, Coumarin, Linalool, Butylphenyl Methylpropional, Limonene. Ingredients may vary. 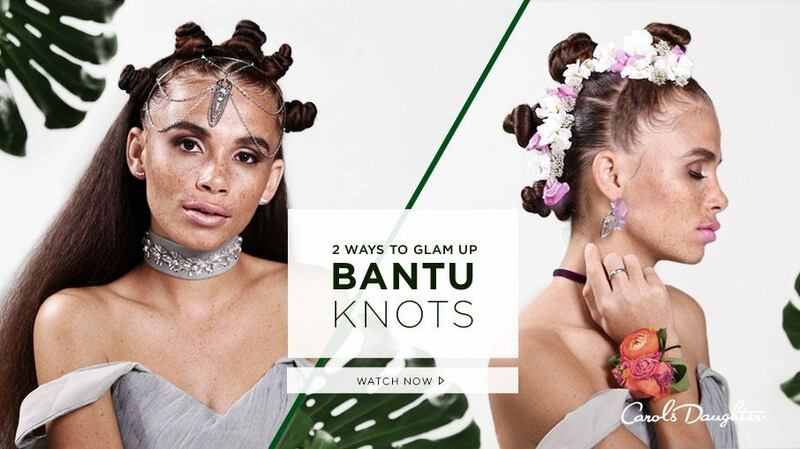 Bantu Knots aren’t just a great protective style – especially for the coilier textures like 4c hair—but it’s also a fabulous way to jazz up your natural hair for special events—especially a summer wedding.